I do an "Ingredient of the Week" challenge with a group of buddies. Each week, one of us chooses an ingredient and we all have to consume it in some form during the week. Sometimes the ingredients are new to us (I'm looking at you, celeriac). Most of the time, though, it's nothing too exotic. It's really just a fun way for us to include a variety of foods on our tables—to ensure we don't get into a food rut with the same meals, over and over. Recently, mango—possibly my favorite summer food—was selected one week and chia seeds the following week. I actually eat these both pretty regularly. But for some reason, I rarely put them together. I decided to make a smoothie bowl that highlights the pairing. Speaking of smoothie bowls, have you entered our Blendtec giveaway yet? Just a couple more days left to enter for your chance to win an amazing, high-powered blender. 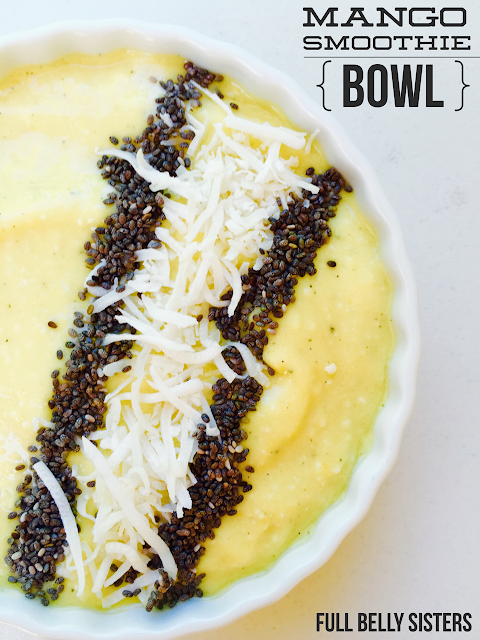 And then you can make smooth, ice cream-y smoothie bowls like this one! Life is better with a really good blender. And I'm only being slightly hyperbolic with that statement. Place yogurt, mango, hemp seeds, and coconut in the high-powered blender (or food processor). Blend until smooth. It should be the texture of soft-serve ice cream. 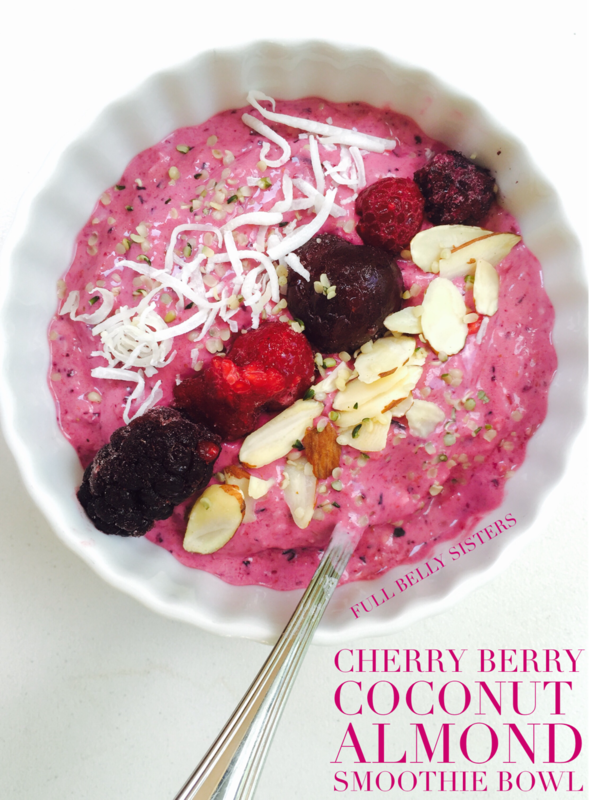 Spoon into a bowl and top with the chia seeds and additional coconut. This bowl is just a really bright way to start the day. It's also packed with protein, good carbs, probiotics, fiber, omega-3s. Good stuff. Have you entered the Blendtec giveaway yet? What are you waiting for? So pretty!! I usually do not have time to sit down and eat anything in the morning, so this is going into my smoothie cup for my commute. :) Question about hemp seeds: A cookbook I've been using says I should buy hemp hearts, not hemp seeds. Trader Joe's sells something they call Hemp Seeds but then the package says they are hemp hearts. Are they really just the same thing? Haha, if i don't finish a smoothie bowl, i just put it in a cup and drink it the next day. Still works! Hemp hearts are hulled hemp seeds. Some people say you should only eat the whole seeds (which stick in your teeth!). I actually do use those TJ's hemp hearts/seeds. I think some of it depends on the marketing—some companies seem to use the terms interchangably. This looks delicious! I can't wait to try it. I definitely NEED a blender, I could be making these all of the time. Thanks for the recommendation I'll have to check those out. I think Mango and chia would go perfectly together. This one is calling my name. YUM. This mango-chia smoothy bowl is so original and full of flavor! We love it!! I love the idea of smoothie bowls. These are a great idea for a busy school morning. 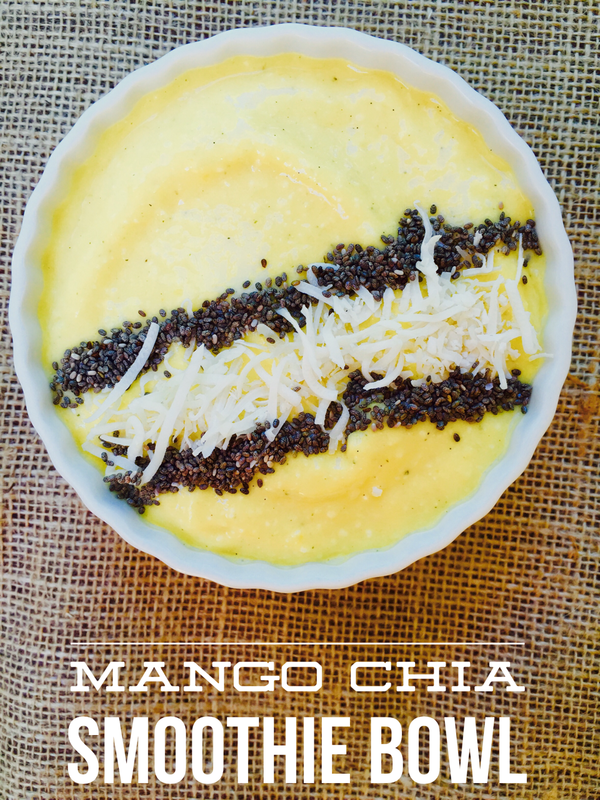 Mango, chia seeds and kefir - that describes my kind of breakfast! Love that it's both very healthy and delicious! The perfect breakfast! YUM! I love all these flavors. A delicious and healthy breakfast to start the day. These smoothie bowls look awesome.